The 17th annual Network World holiday gift guide has something for every techie (and techie-wanna-be) on your list. Things are hopping at Santa 2.0 (S2) – the new name for Santa’s Workshop. The North Pole toy factory has undergone a serious digital transformation, with centuries-old processes giving way to new and more efficient methods. Even the sleigh has gone digital – it’s now a self-driving, self-flying gift distribution system. Initially the S2 team wanted to hire Uber drivers to deliver presents, but after some more tinkering the autonomous system kicked in. But don’t worry – the reindeers are all doing just fine in their retirement. While good girls and boys might still be handwriting their wish lists and delivering them via the post office, once the S2 team gets a hold of the requests, they’re quickly scanned, digitized and processed through the new ecosystem. Collaboration elves all work hard together (via a dedicated private Slack channel) to guarantee that production is on top of their game as well. Drones, robots, virtual reality and other emerging technologies are all being used to make sure that the S2 has another successful holiday season. But what about the gifts, you ask? On the off chance that you haven’t yet created your digitized wish list, we’re here to suggest (for the 17th year, we might add) some very cool technical gift ideas for the special person on your list. Our Cool Yule Elves have been working (and collaborating and disrupting) very hard to create this list. For our absolute favorites, check out the quick-and-easy “Cool Yule Tools 2016: Our Top Picks” if you want to learn more about why we like these particular items, read our mini-reviews below. But first, watch this video highlighting our Top 20! In a technical sense, the Ring Video Doorbell would qualify as a networked video camera, since it has most of the features found in those other “Internet of Things” cameras. But because it has such a cute name (and the fact that it explains what it does by nature of its name), I hadn’t had the opportunity to try it out until this year. Here’s the basics – the Ring Video Doorbell replaces the regular doorbell on your house, adding a small video camera to the top of the button. The system connects to your home Wi-Fi network to connect to the Internet. Whenever someone pushes the button, not only does the doorbell ring, but you get an alert on your smartphone (you download the Ring app in order to receive these alerts). With the app, you can see who’s at the door, and talk to them, as there is also a speaker on the doorbell. So if you’re home or away, you can always know who’s coming to your front door. The device also features a motion sensor that can send alerts, so even if someone at the front door doesn’t ring the door bell, the system will still send an alert (and record the video) when motion is detected. The app lets you adjust the distance that the motion control triggers, so if you live in a busy area you can reduce the distance so you don’t get an alert if a car is driving by or if leaves are blowing. Multiple users can be attached to the door bell, so if you don’t hear the alert, someone else can “answer” the door. Connecting the doorbell to the home network was similar to other systems I’ve tested – you download the app, connect to the device’s Wi-Fi settings, then change it so the device connects to your home Wi-Fi. We had some initial difficulty with our hardware, but fortunately Ring offers great customer service – a 24-hour call center was available and they were able to walk me through a hard reset of the device to get it connected again. The physical installation on my house made me a bit wary, as I’m not the handiest with tools. My house had a manual door bell, so I had to uninstall that system (unscrewing the doorbell) and also shut down the power to the house (because I couldn’t find the circuit breaker to shut down just that particular system). The Ring Video Doorbell comes with a mounting bracket and screws – you may end up with an easier or harder installation depending on where you’re placing it and the type of material your house is made of (concrete and stucco walls could involve some drilling). With a clapboard wood house on my end, it was easy to screw the mounting bracket into the wall, but it also meant that I didn’t attach the bottom screws to the bracket because it would have broken the frame (Ring sells a $19 Wedge Kit to help with this). But the top two screws seemed to hold the doorbell just fine, and my re-wiring of the doorbell worked as well. Chalk one up for Mr. Handyman! The Chime accessory ($30) lets you plug in a speaker to another part of your home, which rings the bell whenever anyone pushes the button. I have a small enough house where I didn’t need this, especially since I hardwired the Ring doorbell into my existing doorbell speaker. Ring also makes a Pro version ($249) of the doorbell, which bumps up the resolution to 1080p from 720p, and features a thinner style. If your digital transformation hasn’t gone as quickly as Santa’s has, chances are that you have a box of old photos sitting somewhere in your house, collecting dust. You want to digitize them, sure, but the idea of taking hundreds of photos and scanning them with a flatbed scanner drives you right to the Procrastination Zone. Thank goodness for EPSON, and its new FastFoto (FF-640) speedy scanner. 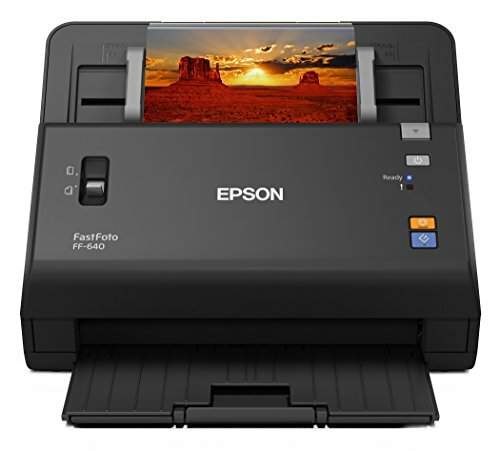 This desktop scanner can quickly scan large batches (up to 30 at a time) of photos at about the rate of one photo per second, letting you get through that shoebox of photos a lot faster than trying to it with other scanners. The scanner also can scan documents into PDF format, perfect for digitizing all of the different tax documents you end up with at the start of the new year. The FF-640 can scan both sides of a photograph at the same time – so if your grandmother had written things on the back of the photo (such as, “Jon diving into the pool, June 1968”), that can be scanned and linked (via filename settings) to the original photo. If you want, the system can create an automatically restored version of the photo, correcting for things like red-eye reduction, contrast, brightness, etc., before you even need to open the photo in an editing program. The initial price tag may give you some sticker shock, but once you weigh in the amount of time you save via the speedy scanning, it becomes a very valuable device. Heck, you could offset the cost by charging other friends and neighbors some money to scan their old photos. Keeping your home smelling nice, and not like it really does (animals, kids, cooking) is a huge industry for makers of candles and air fresheners. But until now, most of that is amazingly non-technical. Spray or light, done. The Aera Home scenting device brings the world of fragrant aromas into the modern era. This small device plugs into any power outlet, and has a slot/loading tube available for several different fragrances. Users pop a scent into the loading tube, and the system starts pumping out the scent throughout the room the Aera is plugged into. The unit includes a 1-10 rating system for how much scent you want distributed, with 1 being not a lot to 10 being “We have to really knock out the smell in this room”. Better still, you can connect the Aera to your home Wi-Fi network and, via the Aera app, can set schedules for when the machine turns on / off (it’s not much use to have it working when nobody’s home or everyone’s sleeping). The app also tells you how much scent is remaining. While candles and air fresheners might be less expensive, they do come with some issues (store-bought fresheners run out too fast, or the potential fire issues with candles). The upfront costs may be a bit higher, but capsules do last a long time (we’ve had ours running for a few weeks and we’re still at 85% with the first fragrance capsule. If you are fortunate to have a bar in your home (or man cave, or some other area where you entertain), you can now have something that creates the draft beer experience without having to shell out money for a more expensive draft system. The HomeTap is a refrigerated cooling system that includes a tap, with the ability to draw beer from a smaller source. That source, of course, being specialized HomeTap bottles from the Hopsy website, which features small craft brews. The unit is small enough to be used in your bar, or brought upstairs for temporary parties and gatherings. If you’re really into beer, being able to order different styles from the website and then produce them through the HomeTap device is a great alternative to heading to a liquor store or other location, where you might not know how long ago your beer was brewed. If you were one of those kids who always wanted X-ray vision goggles after reading the latest Richie Rich or Spider-Man comic, you’re kind of in luck. No, you won’t be able to see through anyone’s clothes, but there is a device that lets you “look through walls”, so you can kind of pretend that you have super powers. More importantly, if you do a lot of construction work and need to see whether there’s a pipe or other obstruction hiding behind some concrete or drywall (up to four inches), the Walabot DIY tool is beneficial. This device, about the size of a modern smartphone, attaches via USB-C cable to your Android smartphone (5.0 Lollipop, 6.0 Marshmallow supported with OTG; 7.0 version coming soon). A sensor on the unit can then detect things behind the walls, such as plastic and metal pipes, electrical wires and studs. Heat sensors can even tell when you have something living behind the wall (ewww, rats!). Calibration can take some time, but once you get the hang of using the device and the app together, it can be a valuable tool that could prevent a possible disaster (cutting in the wrong place, or creating a damaged pipe, wire). IoS devices are not yet supported, but you can sign up to receive updates on when an Apple-compatible unit is available. It may feel like we’ve passed the opportunity for digital photo frames, as pretty much everyone has access to either a smartphone, tablet and/or Facebook account in order to see and share photos with everyone else. If the idea is to send Grandma photos that she can see of the grandkids, chances are that Grandma is on Facebook and can see them when you post them there. Still, there’s a cool appeal around digital photo frames, especially for photos that come out really well or more portrait-based pictures. With the advances being made with smartphone cameras, you’re going to have a lot more good or great photos that you’ll want to display on something that isn’t a computer or tablet display (as good as those are). 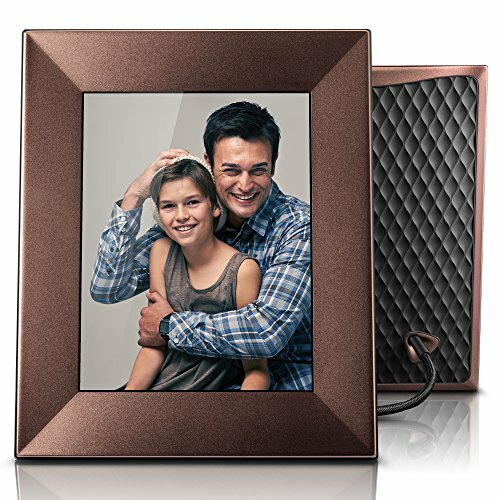 The Nixplay Iris digital photo frame is the latest model from the company – it features three choices of silk-metal finishes – Peach Copper, Silver or Burnished Bronze. The frame is powered via a strong, bendable cord that also acts as the frame’s stand – you can bend it to display the frame in either portrait or landscape mode. We did have some problems with the cord and getting it to stand in one place (partially because we were standing the frame on a slippery surface). The frame then connects to your home Wi-Fi network in order to access the Nixplay cloud service (Nixplay Cloud, which offers 10GB of free storage for photos), where you can load photos to the frame (no manual upload required). In addition to direct uploading of photos to the service, you can link photos to albums from social media accounts (Facebook, Google Photos, Instagram, Dropbox and Flickr all supported). Nixplay has its own app that you can use, which then lets you instantly share photos to a connected frame from your smartphone, with the ability to add captions. You can also have additional friends or family members upload photos to the frame, so Mom and Dad can send photos that Grandma can see on the display. Two other interesting features on the frame – it has an ambient light sensor that detects how light or dark a room is and adjusts the brightness settings for the photo frame to match the light. So if you’re in a dark room, the frame won’t be blasting out a bright image. A second cool feature is a sound sensor that only turns the frame on when it can detect sound. If you’re not at home, the frame will turn off. You can also set schedules for the frame to turn off overnight, for example. A handy remote control also comes with the device, which lets you power the frame, advance photos in the slideshow and manually adjust the brightness. So if you want Grandma to be even more updated with photos as life events occur, or if you want a better display for some of your really good pictures, check out the Nixplay Iris. It makes a great gift for anyone looking for a better way to display awesome photos. 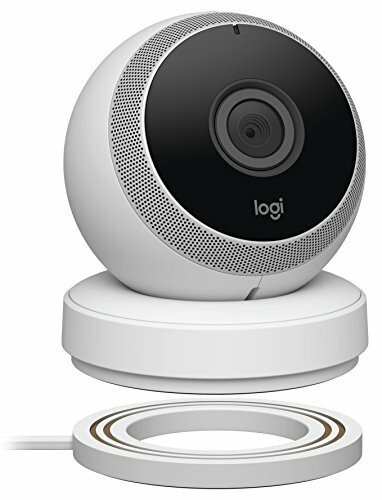 Add Logitech to the list of companies providing small, webcam-sized video cameras aimed to act as a networked security camera (via Wi-Fi) for your home. The Logi Circle offers 1080p resolution (with 135-degree wide-angle lens) images that you can view across the internet via mobile device (once everything is set up). Like a lot of other cameras, you can receive alerts whenever the camera detects motion, which is usually a family member walking into the room or leaves blowing outside (or a car driving by). The system also lets you download and share clips (on the off chance that the camera catches something cool). The device comes with a wireless charging base (similar to wireless phone chargers) that you can detach from, so you don’t have to position the camera near a wall power outlet. Without the charger, the camera has about a 12-hour battery life, so you need to be sure to recharge the camera. For us, it was easier to just place the camera in the charging base all the time. But for temporary situations (Logitech gives the example of watching over a baby’s naptime), detaching the camera was a cool option. Another neat feature is the ability to see a 30-second time-lapse of the past day, based on whatever motion the camera has caught. The video is more interesting if you point the camera towards rooms where action happens, unless you’re the sort of person who likes watching leaves blow by. One small downside – the company only offers 24 hours of free cloud storage, which means you can only access clips for free from the past day. Other companies offer free storage for more time (seven days for example), so it would be nice to see Logitech at least match that time period. One component of having a futuristic “smart home” is using your home network to control the lights in your house. If you want to dip your feet into this space, you can start with the Stack lighting starter kit, which features two light bulbs and a control hub that plugs into a free Ethernet port on your router. With an associated app on your smartphone, you connect to the hub and plug in the light bulbs to the rooms you want to control. It’s an easy setup, you don’t even have to switch the names of the Wi-Fi name (one of the reasons that the control hub is needed). Once the lights are in, you can leave the switch in the “on” position but then turn off the light bulbs with the app. This is important because of a couple of the features of the bulb. First, motion sensors in the bulb can detect when you’re in the room, and will turn off the lights when you leave the area. Second, ambient light sensors indicate whether to power on or off depending on how much sunlight is in the room. Other settings let you adjust the heat temperature of the light bulbs, as well as the overall brightness. Preset options let you change lights based on mood – for example, there’s a “Relax” mode and a “Focus” mode that provides different mood lighting. You can also set up alarms that tell lights to turn on/off based on the time of day, or set a schedule for having the lights go on or off and their associated settings. Additional light bulbs cost $45 each, so installing these in every room of the house could get expensive (hopefully, the bulbs last longer than traditional bulbs). There are some cost savings associated with having the sensors – in theory the lights would go off when nobody’s in the room or when it’s sunny outside, saving you money if you have kids who always forget to turn off the lights when they leave a room. In our tests, the lights tended to stay on, but it’s possible they did this because they were placed in darker areas. Some configuration and fiddling is likely required before you get to the settings you enjoy most. 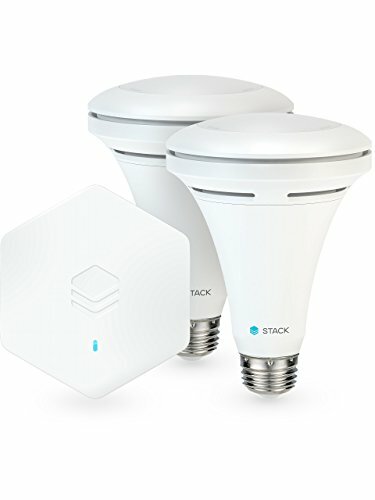 These lights integrate with other smart home platforms, including Nest (we didn’t test this, though), as well as Amazon Echo integration (you could, in theory, say “Alexa, turn on the lights”). We don't have an Echo either, so we couldn't test that.